I study Mandarin in school, which means learning how to read and write Chinese characters. My technique isn’t the best—I write the characters over and over again and hope it sticks. Needless to say, that doesn’t always work. A Way With Words: One of MyWords’ most helpful features is a quiz tool that tests your ability to associate newly learned words with their English meaning. MyWords-Chinese (Traditional) intends to make the process more fun and effective. It’s one of 37 MyWords apps offered by Innovative Language Learning; the company’s MyWords offerings in the App Store run the gamut from Arabic to Vietnamese. Each day, MyWords gives you 10 new words to learn. Tapping on the “i” button reveals the character(s) in larger size, letting you practice pronouncing the word. Tapping Listen causes a recording of the word’s correct pronunciation to play. You can also record yourself pronouncing the word, playing it back to compare to the app’s pronunciation until you get it right. The most useful element of MyWords, though, is the app’s quiz function. The application lists the characters in one column and their meaning in the next, and shuffles them. To connect them, you tap the character and the correct answer and continue until finished. This is an excellent way to learn the characters. Learning words through use is much more effective than memorization, which tends to be temporary and spotty. MyWords is missing two important features. The first is the ability to enter your own characters into the word bank, which would make this an excellent study tool for Chinese courses. The second is support for learning how to write characters. MyWords would be incredible if users could practice writing the characters on screen, as the application recognizes and grades them. 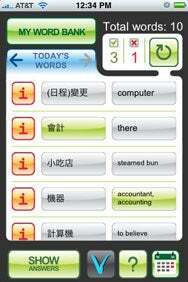 Even without these features, though, MyWords’ Chinese app is a helpful tool for picking up the basics of a new language. MyWords-Chinese (Traditional) is compatible with any iPhone or iPod touch running the iPhone 2.1 software update.